In December of 2000, as families were heading home to see their loved ones for the holidays, doctors in Buffalo, NY diagnosed Robert Maxwell with a form of leukemia. It was a very sobering, scary moment for the Maxwell family, but thanks to a highly-effective initial series of chemotherapy treatments over the next month, the leukemia was knocked into remission where it’s remained to this day. In realizing his dad’s mortality for the first time (and following his sister Ellen’s philanthropic example), Robert’s son, Tim, set out to find a way to show support for his father and others with blood cancer. And with that, ‘The Dude Hates Cancer!’ charity bowling tournament was born. The story doesn’t quite end there, however, because as he was beginning to organize the first annual bowling tournament in Philadelphia in 2006, Tim’s mother was diagnosed with another form of blood cancer, Multiple Myeloma. Through hard work and some growing pains, TDHC has become something special. After growing steadily over the first three years (from $1400 to $3700 to $5100 raised as a third-party event for the Leukemia & Lymphoma Society (LLS) in Philly), ‘The Dude’ began to take off in 2009 when it raised over $27,300 for LLS, earning status as an official LLS charity event. The event has continued to grow, reaching new fundraising heights in Philadelphia and spreading to other cities across the country, including Buffalo, Los Angeles, San Francisco, and Cleveland. Since it’s foundation in 2006, The Dude Hates Cancer has raised over half a million dollars for The Leukemia & Lymphoma Society. On September 4, 2012, The Dude Hates Cancer lost one of its founding inspirations, Lisa Maxwell. 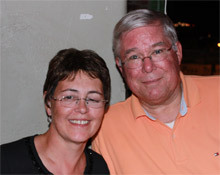 About six years following her diagnosis of multiple myeloma, Lisa succumbed to the disease. 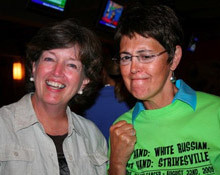 She was a regular at Dude events dating back to the very first campaign, and even attended the inaugural TDHC Buffalo tournament just a month and a half before her passing. Buffalo (8/19/17) @ Resurgence Brewing Co.
Buffalo (8/20/16) @ Resurgence Brewing Co.
Buffalo (8/15/15) @ Resurgence Brewing Co.